Jonathan Edwards is most commonly known as a philosopher, Puritan theologian, and Protestant revivalist preacher. Edwards was a major figure of his day, and an incredibly powerful author who, according to novelist William Dean Howells, “first gave our poor American provinciality world standing.” Edwards is best known for his renowned sermon Sinners in the Hands of an Angry God (seen right). Sermons aside, Edwards had an impact that rings through the years, as his philosophical theology has a strong presence in current theological discussions. He was born on about 100 years after the Mayflower landed at Plymouth, on October 5, 1703 and died on March 22, 1758. He studied at Yale University from 1716-1722. He was born the son of a minster, and grew up filling his time with religious activities. Although, even though he was doing all the right things, Edwards’s faith in God was superficial. The first reading is an excerpt from Edwards’s personal narrative, and tells of his journey from a superficial believer to an incredibly devout follower of Christ. 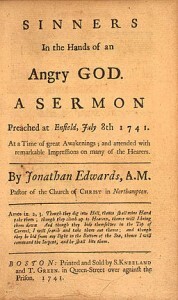 The second reading is an excerpt from Edward’s famous sermon Sinners in the Hands of an Angry God. This excerpt details a warning from Edwards to his congregation, saying that they we are condemned to eternity in hell and only God can save us, although he is not obligated to. He emphatically urges his congregation to repent and turn to God, and therefore be spared from damnation to hell. The third reading is a text written by Edwards’s wife, Sarah Pierrepont Edwards, in which she reflect upon her relationship with God, and how beautiful and majestic He is to her. She writes about how she could spend time lost in the beauty of God in a trance like state, unsure if she was awake or asleep. Her writing style is similar to her husbands; it flows calmly but with power. What was the bottom line of the message Edwards is sharing with his congregation? What tactics did Edwards use to try to persuade his audience? Edwards, Jonathan. “Personal Narrative (Excerpt)” The Open Anthology of Earlier American Literature. Ed. Robin DeRosa. Plymouth, NH: Public Commons Publishing, 2015. Digital File. Wikipedia contributors. “Jonathan Edwards (theologian).” Wikipedia, The Free Encyclopedia. Wikipedia, The Free Encyclopedia, 12 Oct. 2015. Web. 13 Oct. 2015.